In my last video, I talked about how to build and trust by producing something valuable, listening to your audience and being transparent. The next step is to choose a specific audience to go after. No one wants to exclude anyone. When it comes to marketing your service you have a desire to reach as many people as you can. The reality is if you do not decide who to focus on you will not reach anyone. If you target everyone, then no one will feel like you’re speaking to them. As a freelancer, whether or not you get clients determines the level of success in your business. In order for potential clients to pay attention listen to the value you have to offer, there’s a need to decide who to market your services toward. Within every audience, there is a subset or segment of people and if you focus your attention on them more specifically the chances of your messages actually getting through to them drastically increase. You have already seen this in action, especially on television. Let’s take ESPN, if you want to watch sports you know to go to their channel or website because it’s about sports. It’s not that they did not want a large audience but choosing to focus solely on sports makes their marketing easier, now they only have to account for those interested in sports. make your marketing for effective. As a freelancer, your target will be other businesses but what type of businesses is the question. Do you want to be known as a freelance copywriter or a freelance copywriter who focuses on press releases for the healthcare industry? If your too broad people may not know what to go to you for, however if a healthcare facility sees marketing tailored toward their copywriting needs who do you think will stand out the general copywriter or the “healthcare” copywriter. Helena Price is a photographer I would say that she is a world class photographer. She has a great way of capturing her subjects and telling a story with her photos. When you view them you want to know what the person in the photo is thinking. When she first ventured out as a freelance photographer she chose to focus on clients that were in the technology field. Why did she do this? Because she worked in the technology field for many years and was fully aware that the market could use better product photos. Not only that but she lived in California which is known for silicon valley and ton of startups. After taking this focus in just 2 years, she became known as Silicon Valley’s most wanted photographer. Whatever audience you choose you will find that there are different segments of the audience of you are in. 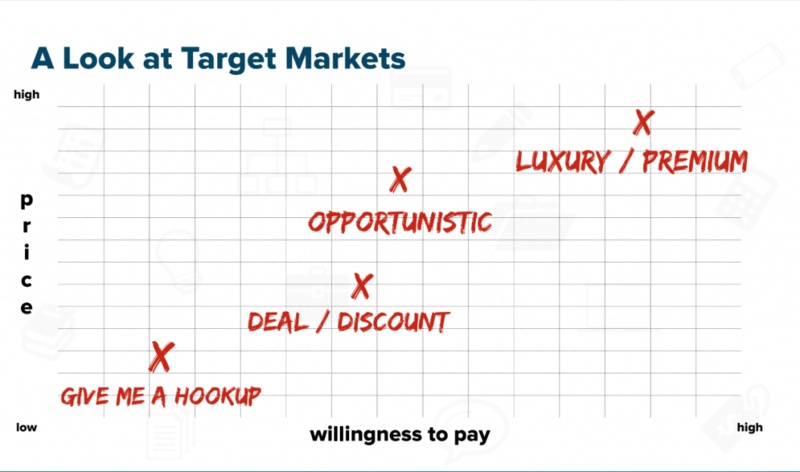 On the vertical axis, we have the willingness to pay and on the horizontal axis we have perceived price and as you can see this makes four quadrants or 4 segments based upon the example. Now based on the niche we are referring to things may change somewhat but, for the most part, any other factors you choose can be used to view varying segments using similar logic. None of these positions are inherently bad, however, each position will require a different strategy for success. Let’s apply this type logic to graphic design freelancers who work with logos specifically. These would be potential clients who are in the market for a logo, however, they do not feel logos should be high in cost and they have a low willingness to pay so as it relates to their budget they don’t plan to spend high amounts on a logo. More than likely these customers are looking for a pre-made logo or even pro-bono logo work from an intern or early starting out graphic designer. In order to service this segment of the market you would have to perhaps make some logo templates and plan on making revenue from volume sold and number of purchases. These clients are focused on finding a good deal. They may perceive your skills as low quality because they perceive your price as too low. They want a stunning logo for a low price, and they may actually recognize a logo is worth more than what they are being charged. If they cannot find a bargain for your logo design they will head to 99designs.com to find it. In order to service this market perhaps, a branding package would be the best course of action. These clients may perceive your price as being too high and they do not want to go over budget. There is an opportunity here to increase these clients willingness to pay by setting a “fair price” or educating the clients about the value an effective logo can bring to the table. In order to target this segment of the market, you may have to teach the client about branding as well as how long well-executed branding leads to sales. These clients are looking for high quality and they are not afraid to pay for high quality because they recognize the value in something as simple as a logo. These type of clients also place a high value on the service they provide for others and recognize the logo will assist them in building their business. When targeting these types of clients recognize they expect top of the line work and expect top of the line service as well. We’ve just reviewed 2 factors and examined the 4 segments. You can take this same logic and decide on a number of factors, we could have used quality and price, or price and longevity, you get the point. If you get anything from this section understand that you must choose the primary audience you want to target your efforts toward.